Which horse has the best pedigree to handle twelve furlongs in the final leg of the Triple Crown on Saturday, June 9 at Belmont Park? My Belmont Stakes alphabetical list continues with Optimizer. Optimizer’s sire English Channel (by Smart Strike) won 13 of 23 races from 2004-07. The turf marathon specialist won such prestigious races as the G1 Secretariat, G1 Woodford Reserve Turf Classic, G1 Joe Hirsch Turf Classic, G1 United Nations, and G1 Breeders’ Cup Turf. He earned more than $5.3 million in his career and in addition to Optimizer he is the sire of stakes winners Skyring, Strait of Dover, and Star Channel. His currently stands for a $25k stud fee at Lane’s End Farm in Versailles, Kentucky. English Channel’s sire Smart Strike (by Mr. Prospector) went 6-for-8 in 1995-96 including wins in Monmouth’s G3 Salvator Mile and G1 Iselin. He has sired many stakes winners including Curlin (2nd Belmont Stakes), Lookin At Lucky, and My Miss Aurelia. Read the rest of this post at HorseRacingNation.com. Will the next Animal Kingdom emerge from the shadows at Turfway Park on Saturday? One thing is for sure. The Grade 3 Spiral Stakes is a wide open Derby prep race and the winner will have the necessary graded earnings to make the starting gate in Kentucky Derby 2012. #11 Stealcase (10-1) is worth a stab at double digit odds. He had a troubled start in a 6th of 13 performance behind Hansen in the G3 Gotham Stakes. He ran into multiple next out winners in his first few starts including promising runners Thunder Moccasin, Ender Knievel, and Windsurfer. He looked good in Gulfstream dirt route maiden tally Jan 19 and can compete here if he handles the footing. The Mark Casse runner dons the hood and sports a bullet for this engagement. #4 Went The Day Well (4-1) is an interesting contender for Graham Motion/Team Valor. He landed the place in both Great Britain turf starts last year and graduated in a flat mile special weight affair at Gulfstream Park March 3. #12 Handsome Mike (4-1) dueled and held the show in the G3 El Camino Real Derby at Golden Gate Fields on Feb 18. He handles any footing but appears best on turf. Joel Rosario rides. #1 Russian Greek (10-1) captured two synthetic route stakes events at Golden Gate Fields and was last seen splitting a 10-horse field in the aforementioned El Camino Real Derby. The Jerry Hollendorfer trainee dons the hood and attracts Nakatani. #3 Heavy Breathing (3-1) easily captured both Gulfstream starts for Todd Pletcher. He is an obvious threat if he handles synthetic ground but probably won’t offer much value. Pletcher also has #5 Holiday Promise (12-1). He donned the hood and landed the place when last seen at Laurel Park Feb 20. #7 Ill Conceived (8-1) just missed in the Battaglia, the local prep for this. He will not get away with an easy lead this time and might find nine panels a bit much. #9 Tizanexpense (15-1) failed to fire from post 11 in the G2 Risen Star last time. He was making steady progress before that and is not without a chance in a tough handicapping puzzle. Michael Maker conditions the son of Tiznow. Maker also saddles #10 Mr. Prankster (12-1) and leading Fair Grounds jockey Rosie Napravnik is in to ride. He flopped in the Battaglia but won back-to-back local stakes races before that. #8 Coach Royal (15-1) dons the hood and goes turf/synthetic. The is ambitious spot for the well-bred maiden. #6 All Squared Away (30-1) will likely attend the pace for sharp SoCal trainer Peter Miller. He faded in the El Camino Real and will probably do the same today. #2 Red Jack (30-1) has dropped all four starts this year for Wayne Lukas. He graduated in a turf route and failed to fire in lone all-weather route last year. The Oaklawn Park 3-year-olds are one step closer to Kentucky Derby 2012 following Secret Circle‘s game performance in the Grade 2 Rebel Stakes on Saturday. Longshot Unbridled’s Note and Southwest runner-up Scatman made the running with Cyber Secret chasing and Secret Circle rating kindly in 4th. The top four retained their positions through six furlongs (1:11.42) with Unbridled’s Note the first to crack. Scatman kicked clear on the bend with Cyber Secret going one-paced. Secret Circle was set down for the drive under Bejarano and went by Scatman with a sixteenth to go. Optimizer found his best stride late and was gaining on the Baffert trainee approaching the wire. In the end, it was Secret Circle by 3/4ths of a length with Optimizer completing the exacta and Scatman rounding out the trifecta. Jake Mo got up for 4th, followed by Cyber Secret and a belated Najjaar. Adirondack King, Sabercat, Pee H Dee, Reckless Jerry, Atigun, and a tired Unbridled’s Note completed the dirty dozen.Ring It Up scratched. I have always been a fan of Secret Circle and love his tenacity and winning spirit but he seems to be reaching the end of his rope in regards to stamina. I have always believed that Optimizer was better on turf/synthetic, so based on those statements, along with the moderate final time in Arkansas on Saturday, I doubt this was a top notch Derby prep. Earlier in the week, Gemologist returned in the pink vs. four Allowance rivals at Gulfstream Park. Gemologist, originally pointing to the G2 Rebel Stakes, stayed in South Florida instead and made short work of Currency Swap and friends on March 16. The Pletcher/Winstar colt made the lead in the flat mile affair around one turn and widened his advantage throughout, crossing the line seven in front. Currency Swap was clearly second best in his needed return and was followed by Angel’s Tune, Jordan’s Image, and Brother Pat. It was tough to get a true gauge on this one. Gemologist looked good and earned a decent enough number but Team Pletcher took the easy way out. 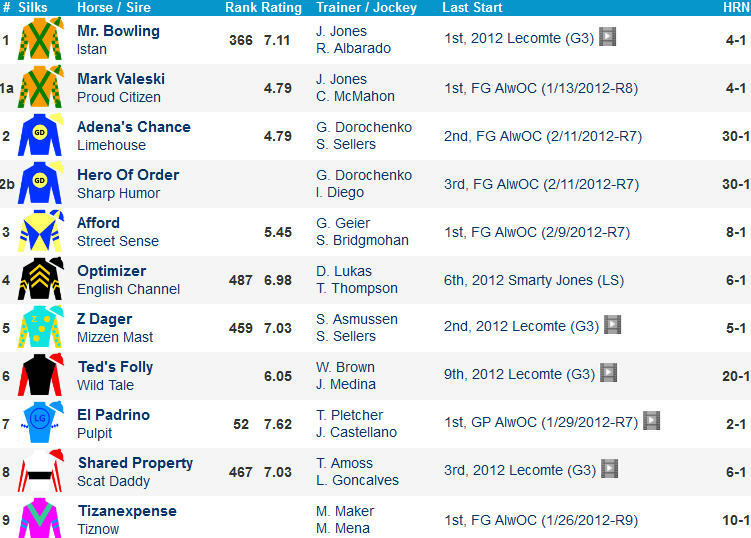 Gemologist has been in my Derby top ten for many months and is currently ranked 4th. This decision by Pletcher reminds me of Uncle Mo in the Timely Writer. The Rebel was ripe for the taking and would have been a much better Derby prep because it was a graded two turn affair against moderately tough competition. At any rate, Gemologist remains undefeated and needs to pick up somewhere in the neighborhood of $100,000 in graded earnings next time to make the gate on the first Saturday in May. Rebel Stakes 2012 Preview – Can anyone beat Secret Circle? The Arkansas sophomores take another step on the road to Kentucky Derby 2012 and morning line favorite Secret Circle will be tough to overhaul in Saturday’s Grade 2 Rebel Stakes at Oaklawn Park. #8 Secret Circle (9-5) is one of the fastest members of his generation for Bob Baffert. The fleet son of Eddington has earned strong Final Time Ratings in all five outings and exits a gritty victory in the G3 Southwest. A mile and a sixteenth should be within his grasp and he figures in the hunt early and often under Bejarano. #4 Cyber Secret (15-1) is worth a stab at square odds. He was only 5-1 against Secret Circle and company in the Southwest and ended up a respectable 5th after racing wide and returning in 16-days. The tactical threat looked great in fast local optional claiming route tally Feb 4 and can rebound with 26-days between starts. #2 Scatman (8-1) gave Secret Circle fits in the Southwest and will probably attempt to go all the way once again. He makes his second start around two turns and could have more to offer in his 3rd race off the shelf. For country music star Toby Keith Kentucky Derby hopeful Reckless Jerry is one of his best Derby chances in years. #9 Reckless Jerry (12-1) has fired Trifecta shots in all seven lifetime starts including underneath finishes in the Smarty Jones and G3 Southwest here. He is one you can use in your exotics. #13 Adirondack King (6-1) will try to overcome unlucky post 13. He was best of the rest in the faster edition of the Southwest and has hit the board in all seven career starts. 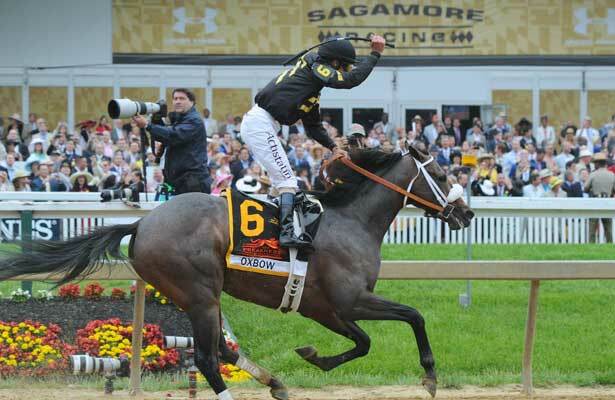 #7 Sabercat (5-1) will take too much action off the shelf for Steve Asmussen. He rattled off three straight to end his juvenile campaign and fattened his graded stakes bankroll in the G3 Delta Jackpot. The versatile son of Bluegrass Cat owns ordinary numbers and might need the race. #6 Jake Mo (20-1) was up for the place in the slower division of the Southwest and can contend for a minor award. #11 Najjaar (6-1) seems pegged too low on the morning line. The late runner is slowly improving and is 2-for-2 at Oaklawn but he lands a tough post and needs to run much faster to make a dent in this salty spot. Calvin Borel sticks with the long winded stretch runner. #9 Atigun (12-1) packs a decent late kick and is 2-for-3 on regular dirt. He necked today’s rival Ring It Up when last seen in a local optional claiming route Jan 15. #2 Unbridled’s Note (20-1) stalked and pounced his way to a good looking debut maiden win under the Twin Spires last October. He took money in his needed Southwest return but never got seriously involved after a troubled start and racing in traffic. He lands the cozy rail and could attend the pace with a clean beginning. #1 Ring It Up (20-1) and #1a Pee H Dee (20-1) run as a coupled entry for high percentage trainer Chris Richard. The former was 4th to Castaway in the slower division of the Southwest and the latter was 4th in the faster division of the Southwest on Feb 20. #5 Optimizer (30-1) exits a disappointing 9th in the G2 Risen Star. Wayne Lukas has given this one every chance to excel on conventional dirt but he clearly prefers turf or synthetic. He fired a local three furlong bullet for this March 13.